The finest quality aftermarket direct replacement of the originals that are no longer available. 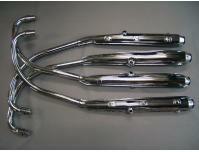 These exhausts will perfectly match the bikes original look and are with the removable baffle. These do not have any markings / stamping on the silencers like the originals. AS OUR PRICES INC UK TAX !